A B de Villiers(133 off 59) shared a record stand with Skipper Kohli(82*) as RCB thumped MI by 39 runs and jumped upto the 4th place in the points table. A special knock by a special cricketer got the crowd at Wankhede Stadium, Mumbai onto their toes every minute of this entertaining encounter between MI and RCB. 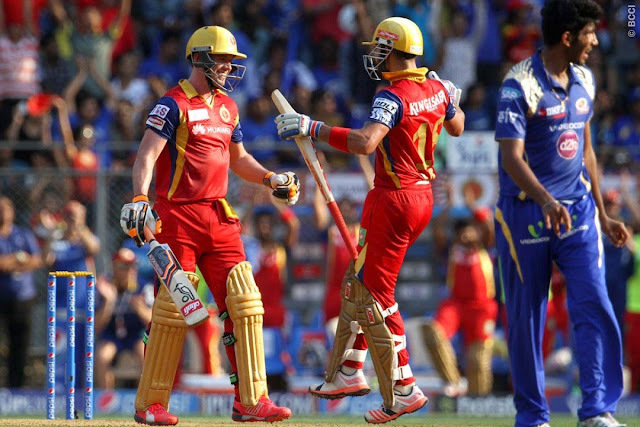 Royal Challengers Banglore won the toss and opted to post a challenging score for their rivals. RCB stuck to their word and got 235 on the board making it a difficult task for the home team. Chris Gayle(13) was an early victim for Mumbai and was sent back to the pavilion due to Lendl Simmons terrific catch. Mumbai was celebrating after Chris departed, little did they know that their destroyer was on his way.,A.B.de Villiers replaced Gayle and played a swanky knock guiding RCB to victory. AB de Villiers breathtaking artistry with the willow tore apart the oppositions ranks. By carting 19 fours and four sixes, de Villiers captured the hearts of the crowd. De Villiers twinned graced with superhuman skills to effortlessly bisect the gaps and reached his century in just 47 balls. His knock turned out to be the highest score in this year's IPL. De Villiers also stitched an unbroken stand of 215 with Virat Kohli. It is now the highest for any wicket in the history of IPL as well as T20s. Virat Kohli (82*) once again played a Captain's knock for his side, supporting his team mate to reach his career milestone. Several splendid shots were seen coming from Kohli's bat too, and both the men on the crease were on fire towards the end of the 1st Innings. This match was also very special for the Challengers as their Captain completed 3000 runs in the Indian Premier League. 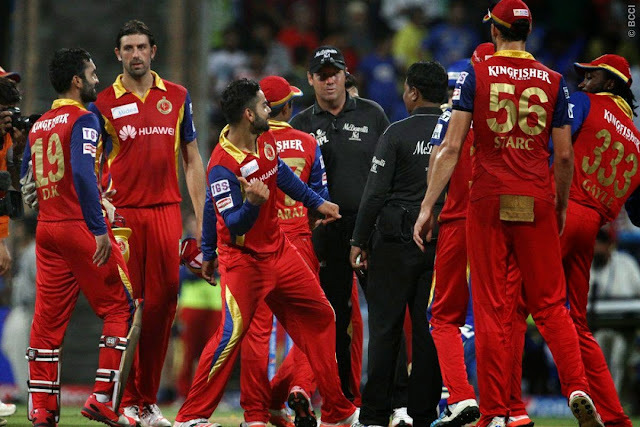 It was just another bad day for the Mumbai Indians as their bowlers failed to corner the RCB batsmen and intern got a whacking. Dropping too many catches cost the Mumbai Indians too much. The 2nd half of the game was no better for the Mumbai lads, despite Kieron Pollard and Lendl Simmons essaying fine knocks, MI slumped to a defeat. Mumbai's wicket keeper batsmen Parthiv Patel departed early and even skipper Sharma was not able to make much of a difference. The only man who gave MI a glimmer of hope of overhauling the massive target was Pollard(49) by landing crunching blows and playing some wonderful shots that kept going to the crowd time and again. Sreenath Arvind snarled Pollard's wicket and that was the end of MI. 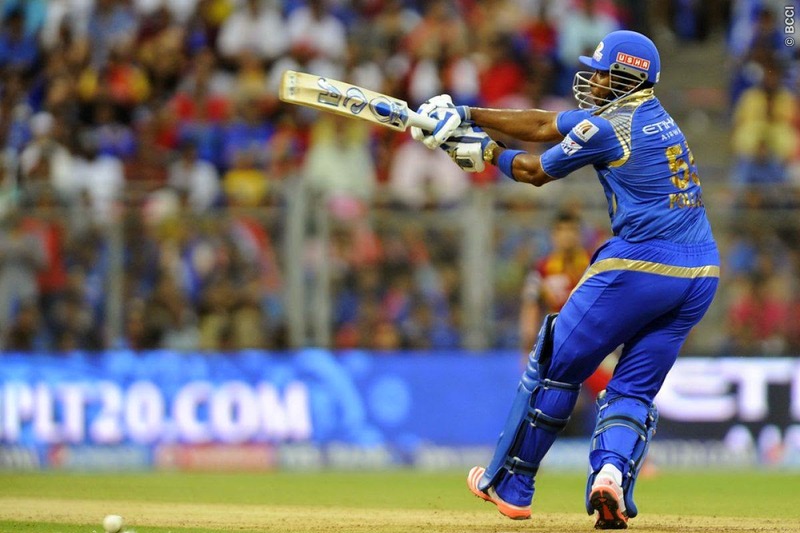 The lower middle order collapsed like nine pins and Mumbai Indians suffered a 39-run defeat at the hands of RCB. The Red Army picked up timely wickets keeping their team alive in the game every minute. The Man Of the Match award was bagged by AB de Villiers for his 59 balls 133. A B de Villiers(133 off 59) shared a record stand with Skipper Kohli(82*) as RCB thumped MI by 39 runs and jumped upto the 4th place in the points table.